Don’t stick your hand in that shell! You don’t know who might be home. It could be a carnivorous snail or a “clawsome” crab. 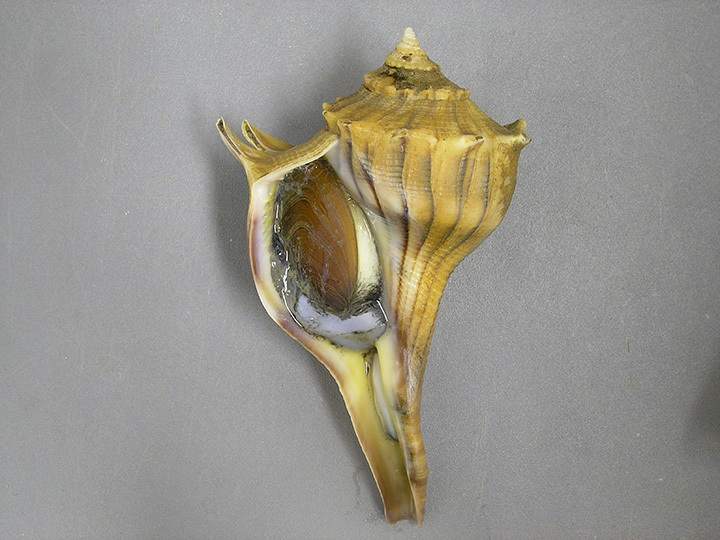 Take a look at our Texas state shell, the lightning whelk or left-handed whelk, which feeds on bivalves like oysters and clams. Perhaps the snail that makes the shell is still hiding inside, or perhaps the shell is home to a hermit crab. 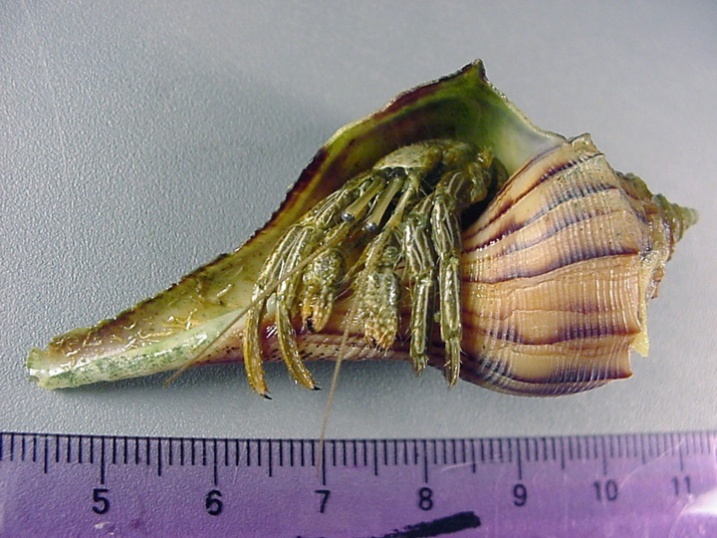 Unlike most crabs, hermit crabs use the shells of snails as homes to protect their soft bodies. Hermit crab taking residence in an empty lightning whelk shell. Lightning whelk snail retracted into its shell, operculum blocking the opening. Most folks will notice some of the upper-level consumers: birds like pelicans and gulls. Who could miss the gull snatching your unattended hotdogs? Or the pelicans plummeting into the water face first to catch fish? Maybe you’ve noticed fishermen along the beach as they pull in small bonnethead sharks. Some animals may require good timing and tons of mosquito repellent to see, like our rare and critically endangered Kemp’s ridley sea turtle. If you pay attention, there are even rattlesnakes catching mice that are feeding on insects and plants in the dunes! 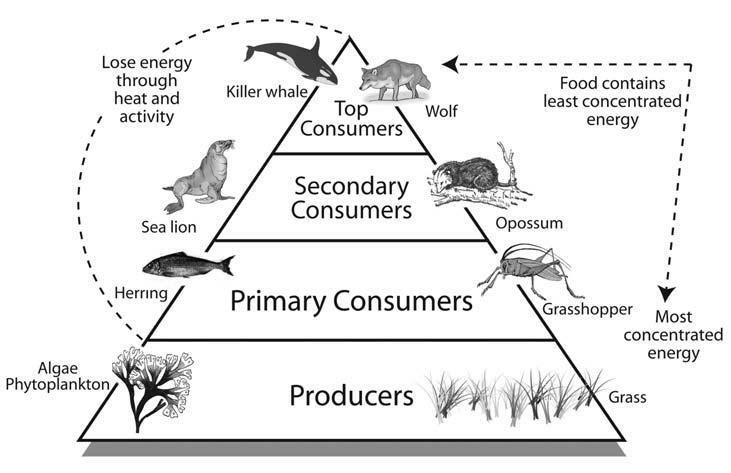 As you follow a food pyramid from the apex down to the base, top predators like humans and sharks feed on the organisms in the level below. There you might find the larger bony fish we feed on, like redfish or snapper, and below them you can find some of the crustaceans and mollusks they feed on in turn. Crustaceans, like our blue crabs, stone crabs, and the smaller ghost crabs, often scavenge in addition to feeding on mollusks, worms, or even plant matter. Many of our mollusks are filter feeders, like oysters, pulling algae and plankton from the water. Finally, at the base of the food pyramid, there are the producers. The phytoplankton and algae make their own food with energy from the sun. 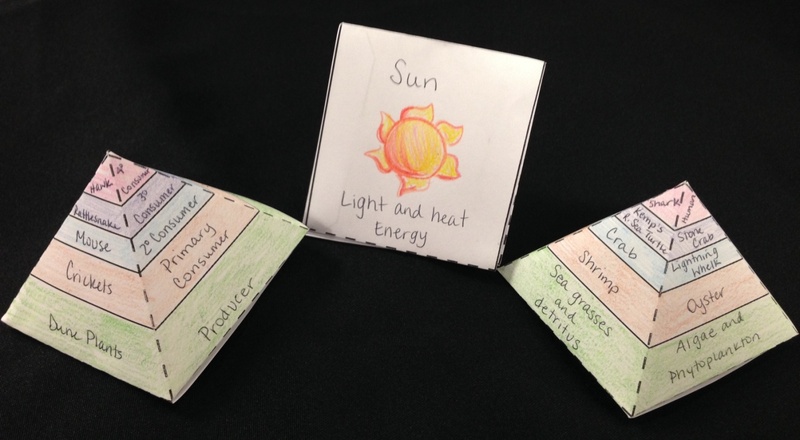 A food chain pyramid is a great way to show different types of food chains on one example. I used a pyramid created by my friend Julia and drew examples of food chains from our coast on it. One side has the trophic levels on it and the other three sides have example food chains. What’s on the bottom of the pyramid? The Sun, of course! Coastal ecology isn’t just about sand, shells, and dodging gulls. It’s also about the interactions between plants, animals, and their environment. The plants anchor the dunes, the dunes protect and replenish the beach sand, the sand houses animals like mole crabs and mantis shrimp, and we get to enjoy it when we protect it. If tracking home beach sand in your shoes, car, towels, and suits doesn’t excite you, our new Hamman Hall of Coastal Ecology may be just the air-conditioned trip to the coast you need on a scorching summer day in Texas. Members, come join us Memorial Day weekend to see wonders of the Texas coastline! Christine manages the live animal collection, teaches weekday dissection labs and summer camp classes, and presents Wildlife on Wheels programs. It has been said that she is "usually carrying something interesting."